Comments: Clone commanders are specially bred and trained for leadership positions within the vast clone armies. They are more capable of tactical thinking and combat strategy than standard clone troopers, and work closely with the Jedi generals during the Clone Wars. 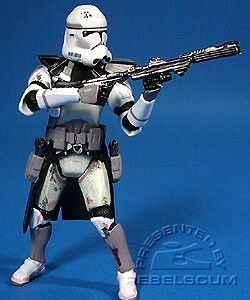 Clone Commander is a repack of the figure from 2005's second Clone Trooper to Stormtrooper Evolutions set. There is a variation to this figure. First run was incorrectly packaged with the Sandtrooper rifle, which was later changed to the correct Clone Trooper rifle. The "Fans' Choice" sticker has now been found on this figure. This character has been officialy named "Coruscant Landing Platform Commander" by Lucasfilm. By switching the belts and removing the shoulder armor, this figure can also double as a standard Coruscant Clone Trooper.